Matt is a professional drummer/teacher based in Wirral, UK where he has been playing drums since his teenage years. He has over 18 years experience playing drums and over 14 years experience teaching. He began over 18 years ago and very quickly joined various bands performing in pubs, clubs and venues across the north west of England. Matt was self taught initially but then after leaving high school he enrolled in Liverpool Community College where he spent the next two years of his education gaining a qualification in advanced Jazz and commercial music. Whilst there he learned so much about music and furthered his drumming knowledge under the guidance of his drum tutor Dave Joseph. Dave really inspired Matt to look at all different styles of music and taught him about professionalism and the role in which the drummer should play within a group/band. After graduating from Liverpool Community College Matt was accepted in the prestigious drum college Drumtech in London. Whilst there, Matt learned from some of the most respected players and teachers in the industry, including Pete Cater, Paul Elliot, Ralph Salmins (Van Morrison, Robbie Williams), Tom Meadows (Duffy, Kylie Minogue) and Bosco D'Oliveira. (Kate Bush) to name but a few. This was an incredible time for Matt and it helped develop his all round playing and sound. 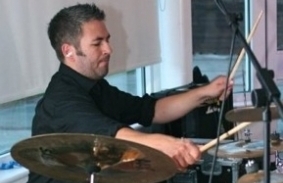 Since leaving Drumtech (Now BIMM) with a Diploma in Popular Music and a BMus in Popular Music Performance degree, Matt has toured the UK and Europe with various bands performing live to millions of viewers on european tv as well as continuing to develop himself as a player and teaching students drums at his studio. Matt has been teaching drum lessons since 1999 to students 1 on 1, in small groups, groups of 30+ and for schools. He has a very relaxed style of teaching whilst keeping it focused in fun. Matt lets the student lead the lesson whenever possible letting the student decide on what they learn whilst also offering advice on what would be beneficial for the student to look at to help there playing progress. Matt has vast experience working with children and young people over the last 10 years. Matt occupied positions with both Wirral Play Council (children age 5-14)and Wirral Youth Service (young people aged 14-25) as well a working at Connexions (career guidance for young people) in Liverpool.